Dunn: "I feel like I'm 18 again" Lynden Dunn can't wait to resume his career at Collingwood after finding a new home in the dying stages of the Trade Period. Watch the defender speak to Collingwood Media after news of the deal broke. Former Melbourne vice-captain Lynden Dunn joins Collingwood after 165 games in the red and blue. Collingwood has strengthened its backline with the arrival of experienced Melbourne defender Lynden Dunn in an exchange of third round draft picks. The Pies switched pick 47 with the Demons’ pick 51 in order to secure Dunn’s services. The strong marking defender played 165 games for Melbourne over 11 years, including 61 in a row during seasons 2013, 2014 and 2015. GM List Management Derek Hine said Dunn’s strong work one-on-one and ability to make good decisions makes him a great fit for Collingwood’s backline. “Lynden fits our needs. At 192cm he can play key back and third tall, he is a fine kick and an experienced, mature defender and leader,” Hine said. Dunn had one of his strongest seasons in 2015 were he played every game and finished in the top ten in Melbourne’s best and fairest. 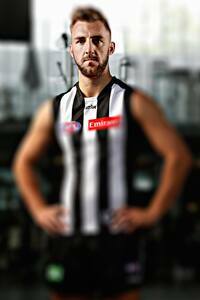 The 29 year old hopes the move to Collingwood will see a return to his best footy. “I still feel I have plenty to give at AFL level… I certainly want to put my best foot forward and I believe that I bring a lot to the table,” Dunn said. “I feel like I’m 18 or 19 again. When I found out there was a chance I could end up at the Pies I hardly got any sleep that night and I felt like it was like draft night again.